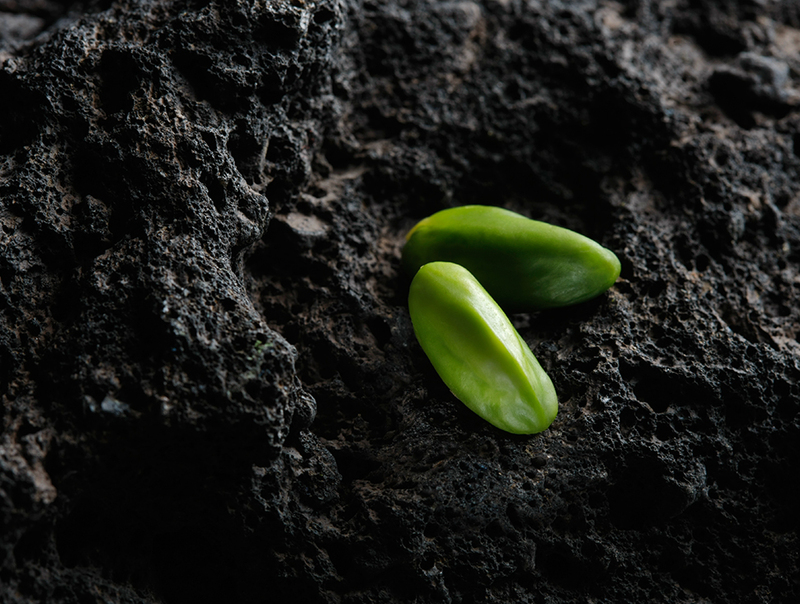 Unique in its appearance, fragrance and taste, a precious commodity because it is individually handpicked in alternate years, Bronte’s green pistachio rightly deserves the appellative of “green gold”, a name by which it has long been known. Each small tree on the slopes of Mount Etna yields only a few kilograms of this tiny aromatic fruit, which, after harvesting, requires a careful and delicate working process. 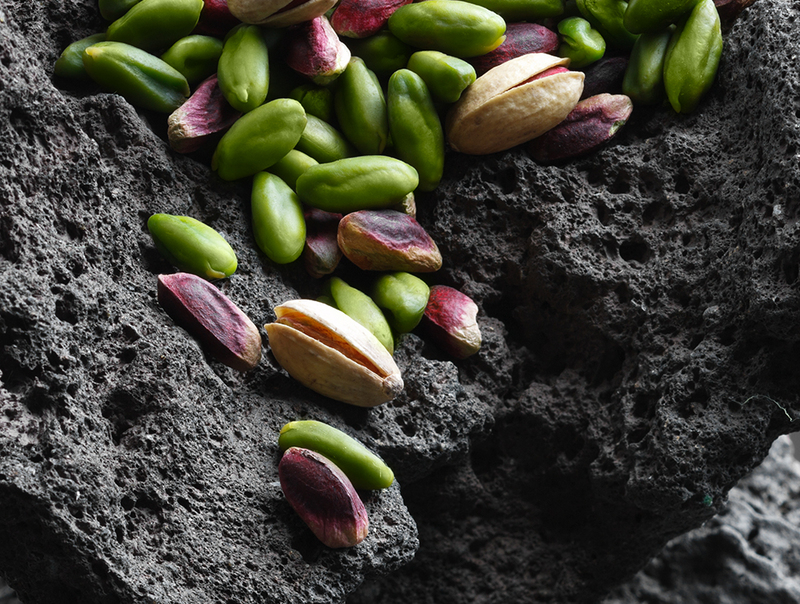 Sicily is the only Italian region that produces pistachio and the main cultivation area of “pistacia vera” is concentrated on the lava around the town of Bronte, whose volcanic soil gives the fruit its original taste, sweet and intense, and its characteristic emerald colour. Italian and international gastronomy and confectionery count pistachio among protagonist ingredients due to its versatility of use and coupling possibilities: from aperitifs to first courses, from second course meat dishes to fish, from vegetables to hot take-away, ice-cream, mousse and oven-baked desserts, excellent quality pistachio assures excellence at table. Caudullo has been working and trading dried fruit since the 1950s, and in particular, pistachio produced in the territory of Bronte, Sicily. The company possesses its own areas of cultivation which it manages personally and directly, and over time it has consolidated working relations with other producers, thus enabling the company to scrupulously select the raw materials. Its modern factory, in Bronte, has production facilities for shelling, skinning, optical selection and packaging of its products, semi-prepared and by-products, and can boast a reputation for reliability and quality, which represents the results of years of experience. The company offers, on the national and foreign markets, the best local production of pistachio, and a range of dried fruit suitable for all the requirements of professional users. The typicality of Bronte’s green pistachio, already a Slow Food presidium, has been recognised by the European Union with the attribution of the P.D.O. certification mark, which guarantees its uniqueness due to its intrinsic bond with the area of production and preparation. The Protected Denomination of Origin is supported by the Consortium for the Safeguard of Green Pistachio of Bronte P.D.O., purposely instituted to valorize the product, inform consumers and encourage technical innovation in order to improve the quality of production whilst resting the environmental characteristics of the territory. The best local production in its various forms: pistachio in its shell, shelled or skinned, in grains, flour or paste. Excellent basic products, obtained according to procedures which assure complete transparency in the food chain, thus guaranteeing the quality and the origin of the product. 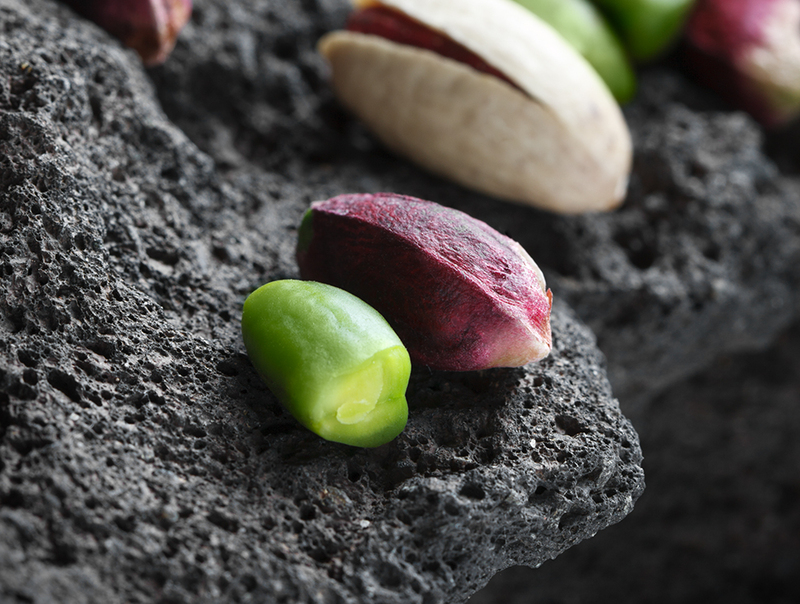 The pistachio fruit in its natural form, enclosed in its characteristic shell which preserves its freshness. It keeps its taste for a long time and if toasted, is a perfect protagonist for snacks and aperitifs. 100% pistachio; product in its shell with dehiscence between 5 and 15% obtained through de-husking and drying of the most recent harvest; the origin is Bronte and the product conforms to regulations. Shelled pistachio reveals the typical variegations of violet in its protective coating. It keeps its taste for a long period and is suitable for both sweet and savoury dishes. 100% pistachio; product obtained through the shelling of the most recent harvest; the origin is Bronte and the product conforms to regulations. Beneath the violet coating, brilliant emerald green: this is the colour of authentic Bronte pistachio. Skinning takes place by means of briefly exposing the fruit to high pressure steam: a rapid and delicate procedure that preserves all the organoleptic characteristics and keeps them unaltered. 100% pistachio; product obtained through the shelling and skinning of the most recent harvest; the origin is Bronte and the product conforms to regulations. Pistachio can be perfectly transformed into grains for creative decoration and in the preparation of recipes for fanciful and inviting dishes. 100% Bronte green pistachio P.D.O. ; product obtained from the shelled and/or skinned fruit, and passage through the granulator. Finely ground, pistachio becomes light flour for use in sweet and savoury dough, the preparation of sauces and creams, and naturally for garnishing cooked dishes and desserts. 100% Bronte green pistachio P.D.O. ; product obtained from the shelled and/or skinned fruit, through milling. Lightly toasted, ground and refined, pistachio becomes a pure paste used in ice-cream making and gastronomy. 100% Bronte green pistachio P.D.O. ; product obtained from the shelled and/or skinned fruit, which is then lightly toasted. Non-refined paste: 50 micron consistence. Refined paste: 20 micron consistence.